Former army fitness instructor Lorraine Murray is now trying to raise £10,000 to get treatment in America and put the nightmare behind her. 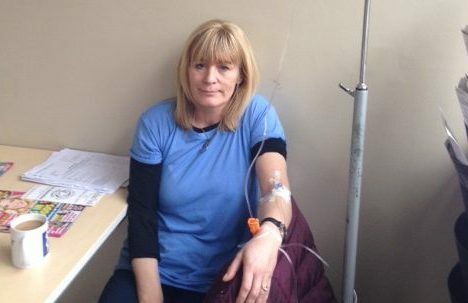 Mrs Murray, 45, from Montrose, has been left virtually housebound since being bitten by a tick in August 2014 while walking her dog at Kinnaber. The mum-of-two has now been diagnosed with three co-infections including babesia microti which is a tick-borne disease responsible for killing two dogs in Essex while three others needed blood transfusions. Like Lyme disease and Bubonic Plague, babesia, which is a malaria-like disease, is a zoonotic illness, meaning that it is transmitted from non-human animal hosts to human hosts. Mrs Murray has already spent £20,000 privately in the UK on treatment as the NHS has been unable to diagnose her condition. She said: “I’m confident with all I’ve read and researched on babesia that I can overcome it but it’s serious, especially if the bacteria were to cycle into the heart muscle. Symptoms of babesia are similar to those of Lyme disease and complications include liver problems, severe hemolytic anemia and kidney failure. Mrs Murray, who lives with sons Macaulay, 11, and James, 10, husband Jamie and her dog Jazz, said her family’s support has kept her going during her illness. She is calling for changes to what she said is inadequate NHS testing and treatment for Lyme disease which can have devastating symptoms if left untreated. Mrs Murray continues to raise awareness during tick season because she said she would never forgive herself if someone else had to go through what she’s suffered. She said: “Ticks can be tiny and they are easily missed and not everyone will get or notice a bull’s eye rash which would be confirmation that the infection has been transmitted. Mrs Murray became severely fatigued in between bouts of what she thought was the flu for 18 months after being bitten by a tick. She was misdiagnosed with chronic fatigue, and then diagnosed with Lyme disease after paying for private testing in Hemmel Hempstead. “The clinic in Hemmel Hempstead specialises in allergies, chronic fatigue syndrome and diseases, however they are quite limited in treatment they can offer,” she said. “My case is a bit more complicated now these other infections are showing active — in fact it couldn’t get any worse. “The US clinics have been treating these infections far longer and the antibiotic protocols are far superior to our treatment in the UK. “It will be roughly £10,000 to fly to the US for treatment and I would have to go out for a second visit within the year.